Last week my husband and I visited WineUp’s new location, hence the new name…WineUp on Williams. Previously located in a 400 square foot space, WineUp moved a couple months ago to a much larger store front in north Portland which has allowed them to add a light food menu, more wine classes and just a better vibe overall. We had a wonderful evening sampling potential Thanksgiving meal wines poured, at first, by co-owner Camille and then taken over by her equally capable daughter, Sweet. The Portillo Sauvignon Blanc from Argentina had a little spice to it, making it an instant suggestion for Thai food. Their current house wine at WineUp is Townshend’s non-vintage Red Table Wine with an actual red table on the label which was clever. It’s a good, affordable, easy-sipping red that would hold up to mild foods but I certainly wouldn’t pair it with a blue cheese. I would, however, pair the 2011 Casteggio Barbera with a blue cheese but the winner of the night for me was the 2004 Greg Norman Reserve Shiraz. Priced at $30/bottle, this one normally retails for at least $50/bottle, making it an amazing value at WineUp. The layers of black cherry and plum were smooth and satisfying, a lovely Shiraz. As is the case with wine bars, the flights poured tend to change weekly and seasonally, for that matter. 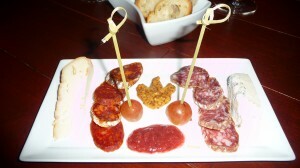 We were served a small appetizer platter of meats and local cheeses, a goat and a blue. The goat paired nicely with the 2011 Belleruche Cotes-du-Rhone Grenache/Syrah blend. Several other small bites, a couple salad options and a few paninis make WineUp a great place for some snacking or a respectable light dinner to compliment a wine flight or vino by the glass. We really enjoyed the medieval, dimly-lit ambience and everyone was friendly and welcoming. I also had the opportunity to pick the brain of Wayne, the other half of this family endeavor and host of WineupTV. Wayne is a wealth of wine knowledge and, before you start thinking that I’m just trying to find words that start with ‘w’, let me say that I found him to be as approachable as his wines and really appreciated the information he imparted on me regarding Syrah, in particular. My quest to find a bottle to pair with the nontraditional tapenade that I knew I was serving on our Thanksgiving appetizer plate was enhanced by his enthusiasm. 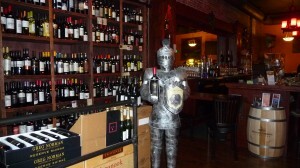 Check out WineUp on Williams at 3037 N Williams Portland 97227 or http://www.wineuponwilliams.com/. You can watch Wineup TV at http://wineuptv.com/.